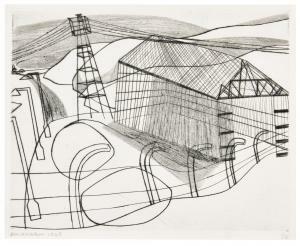 Find artworks, auction results, sale prices and pictures of Ben Nicholson at auctions worldwide. 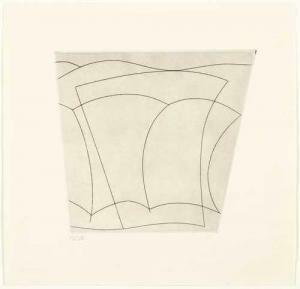 Ben Nicholson, O.M. (1894-1982) 1965 (Ticino) signed and dated 'Nicholson 59' (on the reverse), signed again, inscribed and dated again 'NICHOLSON/1965/(TICINO)' (on the backboard) pencil and oil wash on paper, on the artist's prepared board 18 ½ x 11 ½ in. (47 x 29.2 cm.) Executed in 1959-65. 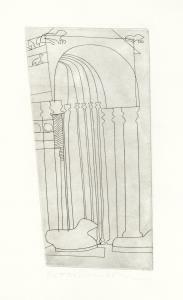 Provenance Anonymous sale; Dobiaschofsky, Bern, 21-24 May 2008, lot 589, where purchased by the present owner. PROPERTY FROM THE COLLECTION OF LEA FORD Ben Nicholson, O.M. 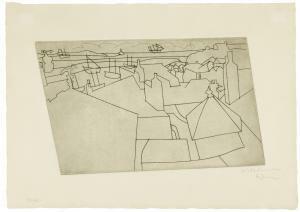 ST. IVES FROM TREZION (L. 43; C. 62) Ben Nicholson, O.M. 1894-1982 Etching, printing with platetone, 1967, signed in pencil, dated, numbered 30/50, with the printer's blindstamp, Lafranca, published byLeslie Waddington Prints, London,on wove paper plate: approx. 16.8 by 27.7cm. ; 6 5/8 by 10 7/8 in. sheet: 26.7 by 37.8cm. ; 10 1/2 by 14 7/8 in. Ben Nicholson, O.M. I.C.I. SHED (ALAN CRISTEA 23) 1894 - 1982 signed and dated Ben Nicholson 1948 in pencil (lower left); numbered 1/10 (lower right) drypoint, printing with burr,on wove paper plate: 19.9 by 25cm. ; 7 3/4 by 9 3/4 in. ; sheet: 26 by 34.2cm. ; 10 1/4 by 13 1/2 in. Executed in 1948, the present work is from the edition of 10. BEN NICHOLSON (Denham 1894 - 1982 London) Forms in Landscape (Columns and jugs). 1966. Etching. 13/300. Unsigned, with the embossed name under the illustration. Image 20 x 22 cm on wove paper 31 x 31.7 cm, minimally trimmed. Published by Kestner Gesellschaft (with the blindstamp). Printed by Lafranca (with the blindstamp).